In 1694, a charitable bequest led to the purchase of a large house on Wincanton common for use as a poorhouse. In 1735, a workhouse was opened in a former non-conformist chapel near Wincanton mill. By 1776, the workhouse could house up to 50 inmates. In 1800, the workhouse inmates were transferred to the poorhouse, with the workhouse building becoming derelict until being converted to housing in 1825. A parliamentary report of 1777 recorded a parish workhouse operating at Charleton Musgrave for up to 24 inmates. County of Somerset: Abbas Combe and Temple Combe, Alford, Ansford or Almsford, Ashford, North Barrow, South Barrow, Blackford, Bratton, North Brewham, South Brewham, Bruton (2), North Cadbury, South Cadbury, Castle Cary (2), Charlton Horethorne, Charlton Musgrove, North Cheriton, Compton Pauncefoot, Corton Denham, Cucklington, Henstridge, Holton, Horsington, Lovington, Maperton, Milborne Port (2), Queen Camel, Penselwood, Pitcombe, Shepton Montague, Sparkford, Stoke Trister, Stowell, Sutton Montis or Montague, Weston Bampfylde, Wheathill, Wincanton (2), Yarlington. County of Dorset: Buckhorne Weston, Kington Magna. Later Additions: Eastrip (1858-85), Four Towers (1858-85). The population falling within the Union at the 1831 census had been 21,096 with parishes ranging in size from from Wheathill (population 56) to Wincanton itself (2,123). The average annual poor-rate expenditure for the period 1833-35 had been £14,796 or 14s.0d. per head of the population. The new Wincanton Board of Guardians had its first meeting on New Year's Eve, 1835. 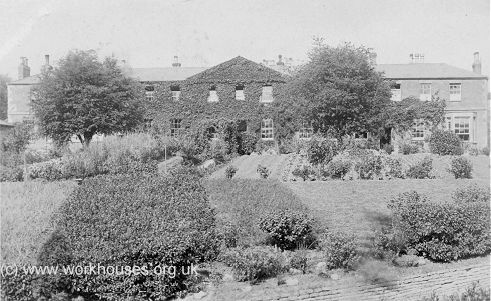 On 4th May 1836, George Wilkinson was engaged to design a workhouse for 200 inmates, with the old parish poorhouse being used in the meantime. The Poor Law Commissioners subsequently authorised an expenditure of £3,300 on construction of the building which was then proposed to accommodate 140. His design was based on the model cruciform or "square" design published by the Commissioners in 1835. The new building, which was was completed in 1838, and the parish poorhouse was subsequently sold off and demolished. The new workhouse had an entrance and administration block at the east. The ground at its front was cultivated by the inmates to supply vegetables for use in the workhouse. Wincanton workhouse from the east, 1908. To the rear was a central octagonal hub, from which radiated four accommodation ranges between which lay separate exercise yards for the various classes of inmates. The site location and layout are shown on the 1880 map below. 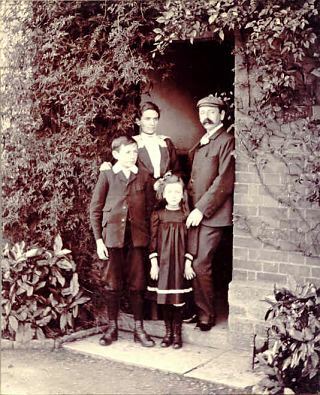 In the early 1900s, the workhouse master was RW Copeman. Copeman also had a keen interest in stereoscopic photography where pairs of images, photographed slightly offset from one another, produce a 3-D effect when seen through a special viewer. 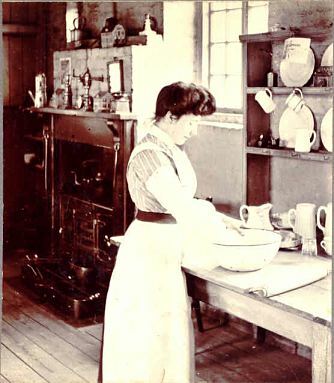 Copeman became president of the Stereoscopic Society and many of his stereoscopic photographs survive, including a number of views taken in and around the workhouse. by RW Copeman, courtesy of Ray Norman. 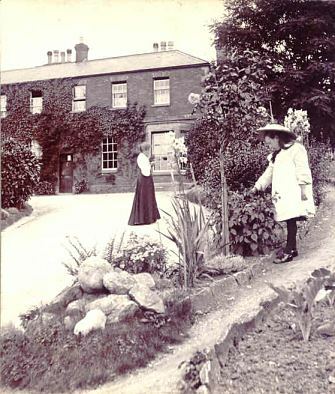 In 1914, following a directive from the Local Government Board, requiring that children no longer be permanently housed in workhouses, those from Wincanton were transferred to Rock Hill House on North Street. 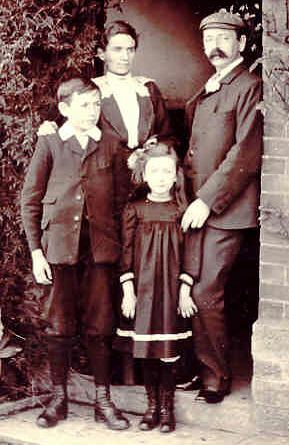 Soon afterwards, the girls were transferred to Linden Cottage, while the boys moved to Rodber House, just to the south of the workhouse. 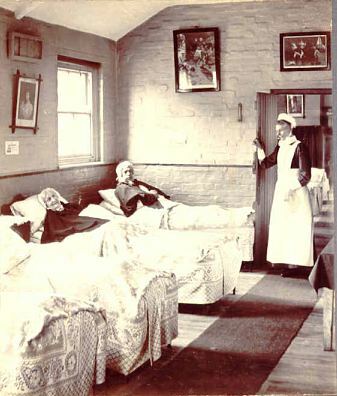 The workhouse later became known as Town View and after 1930 served as an old people home until its closure in 1973 and subsequent demolition. A housing estate now stands on the site. The Wincanton Uion established several children's scattered homes in Wincanton. They were located at: Rock Hill House,23 North Street; Rodber House, Shadwell Lane (for boys); and Linden Cottages, North Street (for girls). Somerset Heritage Centre, Brunel Way, Langford Mead, Norton Fitzwarren, Taunton TA2 6SF. Holdings include: Guardians' minute books (1836-1930); Admissions and discharges (1836-1912, with gaps); Deaths (1866-1907); Creed register (1869-1930); Leave of absence book (1914-1919); etc. Thanks to Ray Norman (www.worldofstereoviews.com) for RW Copeman material.